To coincide with the Black History Month celebration at our middle campus on Wednesday, February 13th, ANCS Nutrition is preparing a special menu of recipes from chef Edna Lewis made with ingredients sourced from local African-American owned farms. Edna Lewis has been called the Julia Child of southern cooking, and published a number of ground-breaking and influential cookbooks from the 1970’s through the 2000’s. Born in Freetown, VA, Lewis spent most of her career working in restaurants in New York City, and spent the last years of her life in Decatur, GA. 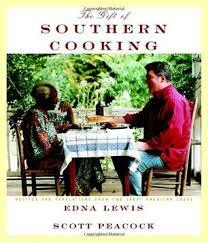 Recipes for the menu at ANCS come from her books, The Taste of Country Cooking and The Gift of Southern Cooking. The menu will be collard greens cooked in pork stock or pac choi with garlic and olive oil, lentil and scallion salad, green salad with vinegar dressing, Virginia country-style beef consomme, hot spiced beets, and hot crusty buttermilk biscuits. Most of the ingredients for these dishes was purchased from African-American owned farms in Georgia including Mayflor Farm, Grow Where You Are, Local Lands, Loaf Aquaponics, and Swanson Family Farm.